You all will be so PROUD of the progress I’ve made on the guest room makeover this week as part of the New Year New Room Challenge. It’s shaping up to be a beautiful, colorfully decorated space. For now, it’s a mess. Since I waited so long to order the headboard, my original blue choice would not be here for 4-6 weeks, so I had to shift gears to this charcoal linen headboard with a similar silhouette. I think this may have all worked out for the best because it’s more neutral, a little less tall and it was about $100 cheaper than the original one. 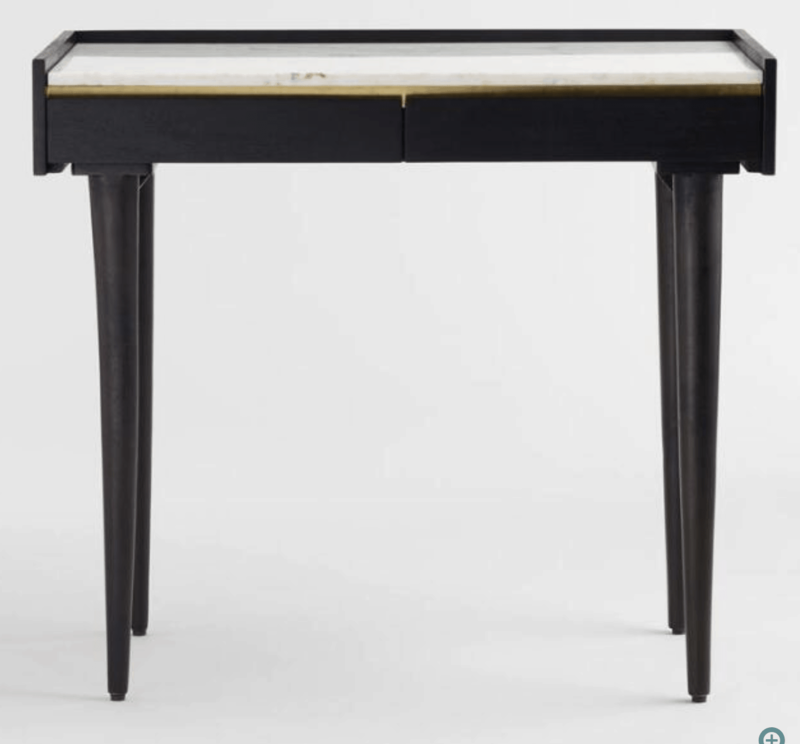 The black marble desk for Daniel also got ordered, and it’ll be here towards the end of this week. Since it is black with marble, I do think it’ll pair beautifully with the darker color of the headboard. My colorful, floral rug from Home Dynamix also came in, and all heavy things are on deck to help get this sucker flattened out. 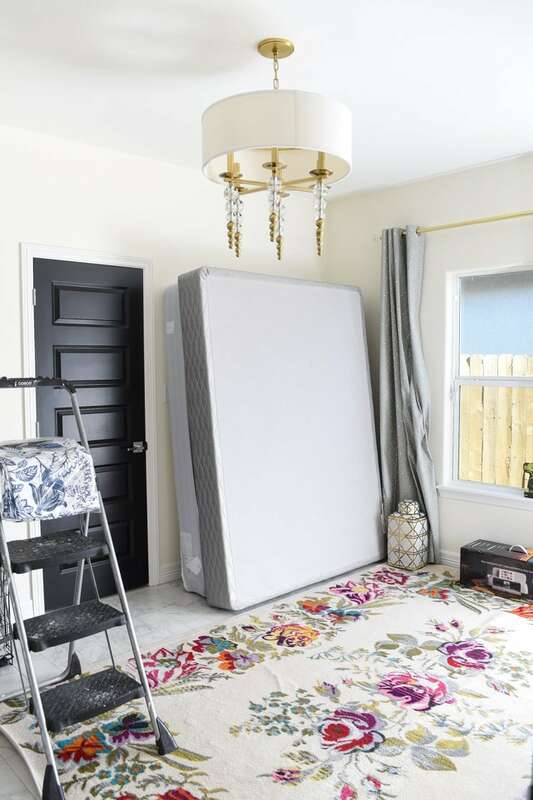 Do you have any tricks for getting rugs to flatten out quickly? 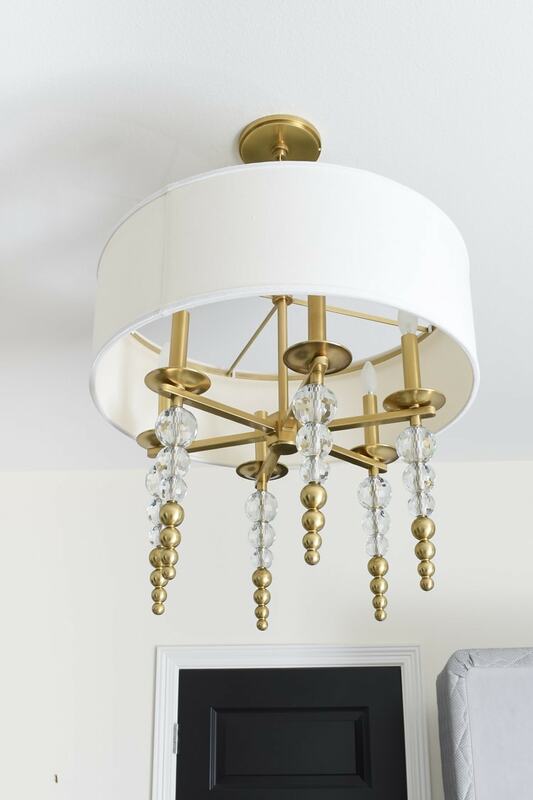 But, the most exciting thing happened…the AMAZING Persis Chandelier from Hudson Valley Lighting came in and was installed this weekend. I hired it out to avoid having to pester the hubby, and it was money well spent. 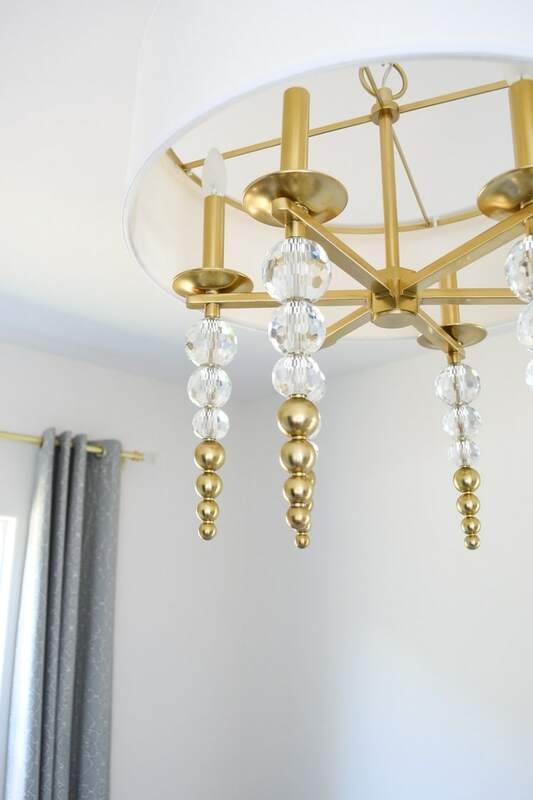 Confession: when the chandelier came in, I was a little nervous that maybe I chose one a bit too big, but it is PERFECTION. It is a statement piece, and I love the boutique hotel vibes it adds to the small guest bedroom. I ended up shopping Amazon for the curtain panels and bed skirt, and I made a huge mistake with the curtain panels I chose. It’s just too busy with the floral rug, so I’m switching gears to a solid panel on some clips. 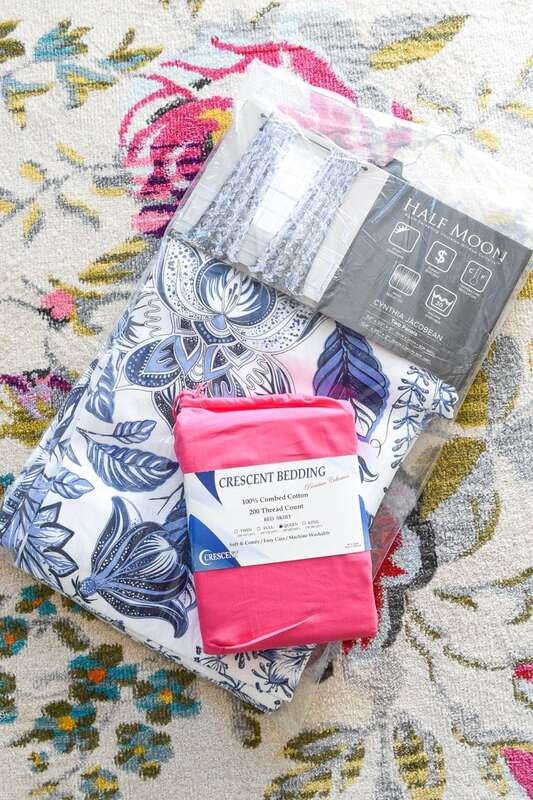 The hot pink bedskirt was a total bargain though, and I’m hoping with a good steaming it’ll look crisp and polished once we get the bed set-up. The final to-do’s are to hang the artwork (frames are enroute from Art to Frames! ), get solid curtains, procure the bedding (pillows from Loom Decor are on their way!) and get the desk and media stand into place in this corner. The desk will go where the media chest currently is, and the media chest will be on the wall where those two random hooks are. 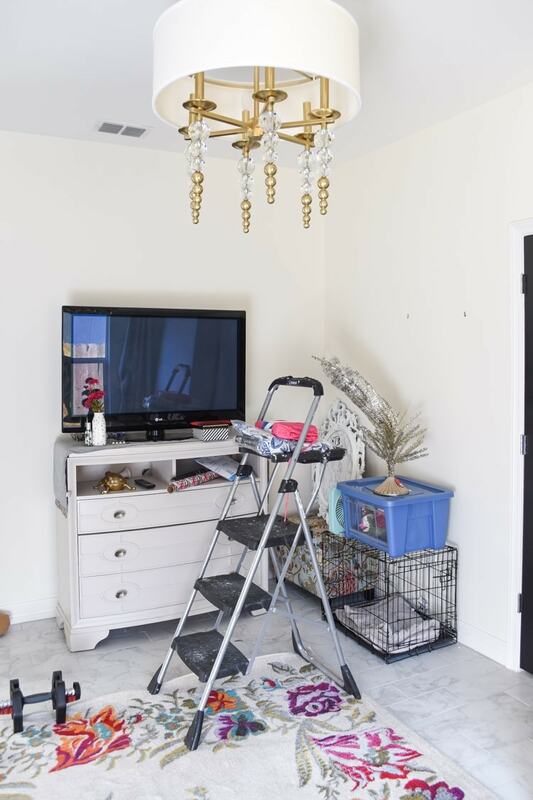 I’m eager to accessorize and decorate- it’ll be minimal to allow the room to feel clean and airy. Here’s a sneak peek of some of the accessories. 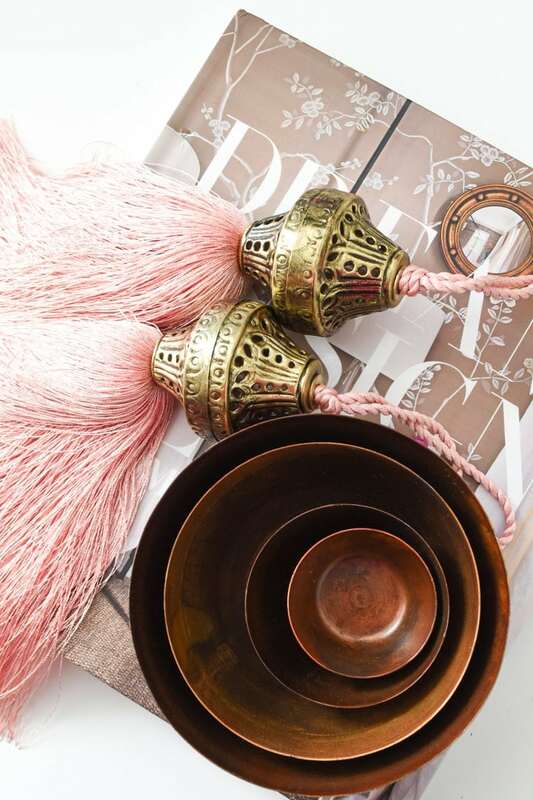 Beautiful pink tassels (for the drapery panels) and aged brass nesting bowls for the nightstand courtesy of Boho Luxe Home. I can’t believe I’ll have a full reveal for you all in a week given that I feel like I just got going on this space. But it’s a room refresh, and I’m opting for simple, no paint, no fuss! 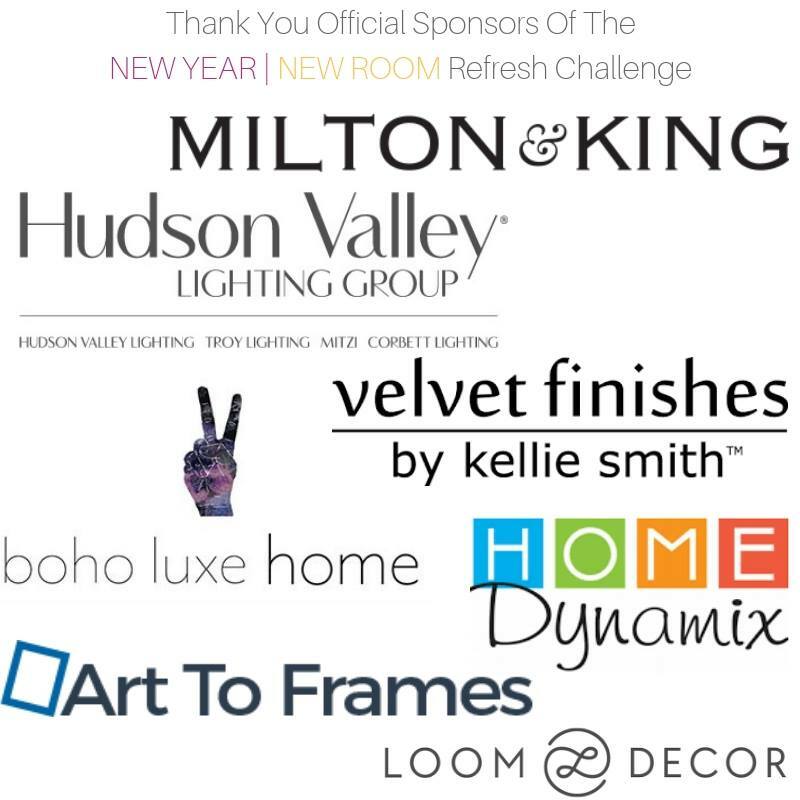 My friends are also in the final stretch of their room makeovers, so head over to check out their progress. And a big thank you to the sponsors making these spaces more beautiful! Loooking good!! Love the pink hints and he rug is beautiful ! Love the direction you’re going with this room. That Chandelier and Rug are both stunning. Can’t wait to see more. It’s all coming together! 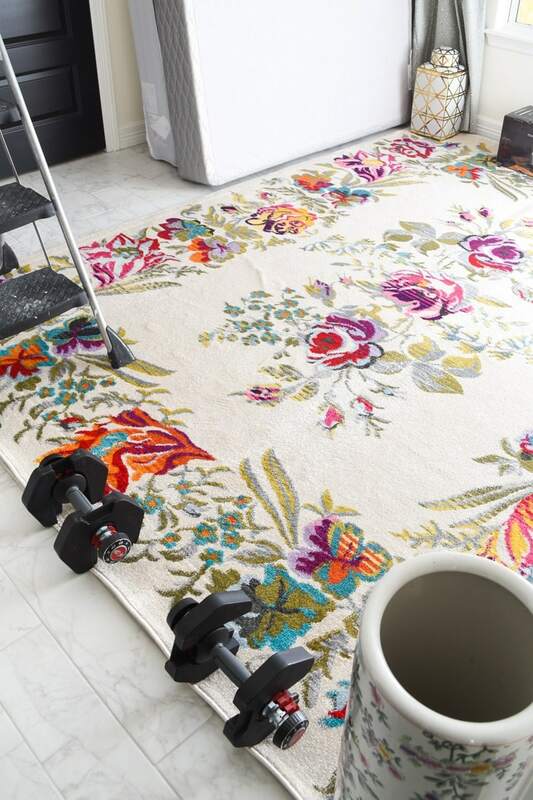 It’s fun to see the dumbbells on your pretty rug 🙂 Way to think outside of the box! I look forward to seeing your big reveal next week!